Global chatter. 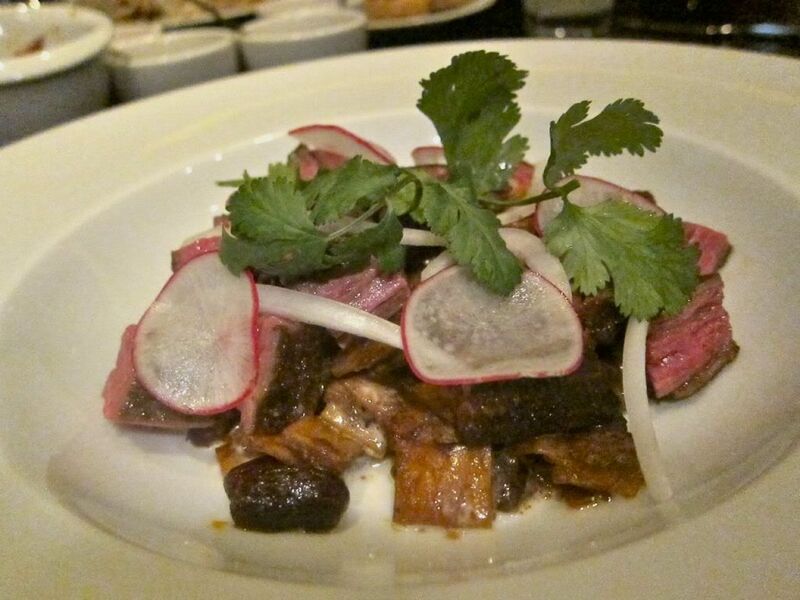 Heat at Empell�n Cocina. Lugo Caff� Again. Jeanne and Gaston. Daniel's Birthday. Friends often forward laughs - I like that better than chain letters with prayers or recipes that carry a curse if you break them. "Thanks God the UN is a reality," writes my Parisian friend Yanou Collart, atop a global round robin that seems to have come from our old friend Yue Sei Kan in Shanghai. A red and blue Warhol screen print up for auction at Phillips de Pury & Company inspired today's Fork Play colors. What keeps a critic eating out six nights a week after 43 years? For me, it's my faith that just beyond the next ma�tre d' stand is a gifted new chef, a veteran who's suddenly cooking on all burners or a dish that will surprise and haunt me. That's what I'm imagining as I wake up every morning. Still, it's a delicious shock when brilliance explodes, as it did last week at Empell�n Cocina, the new cantina by Alex Stupak and his pastry chef-wife Lauren Resler in the East Village. Maybe it was the unusual crisps. Layered and rough, almosty tweedy. Maybe it was the remarkable guacamole, studded with bits of pistachio, under a flutter of cilantro leaves. Already I'm wired. I taste the guac, once, twice, again, just to be sure. But it was the carrot salad that curled my toes. It looks mysterious, almost diabolical, black and muddy like a bad dream in a Hitchcock movie or a primal forest, pickled carrot discs and long thin twists of baby carrot dotted with sesame seeds like scorpions on yogurt. 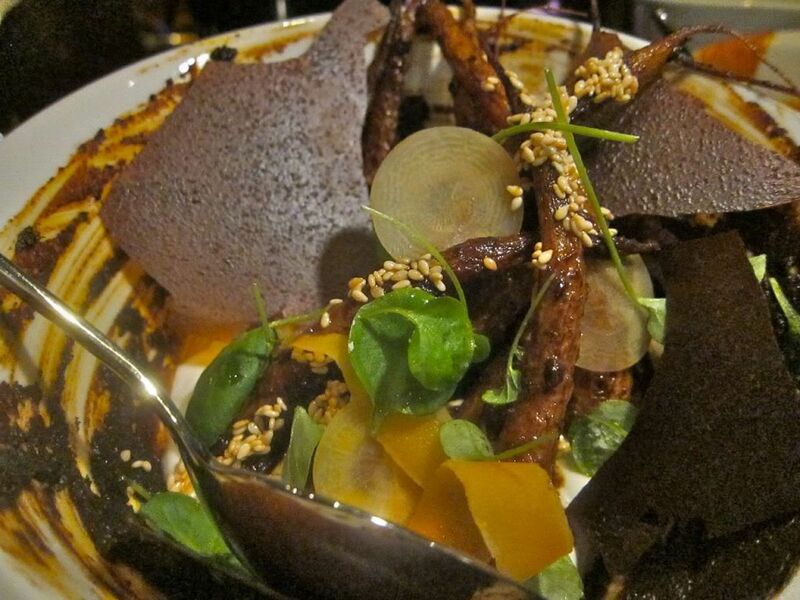 The mud is mole poblano, painted on the bowl, with shards of mole tuile -- thin as paper, crunchy, sooty, silken, tangy, hot, with watercress leaves to cool it down visually. I keep looking into its depths. It's like eating a Caravaggio. For more on what to eat when you go, click here. 105 First Avenue between Sixth and Seventh Streets. 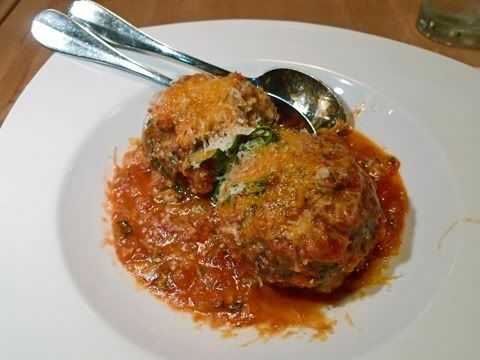 The Road Food Warrior and I loved Lugo Caff� in May, 2010, when Chef Sam Hazen called to say he was consulting there and, needless to add, Sam added: "It's fabulous." The only thing wrong with Lugo was its address - 1 Penn Plaza. You'd think that being perched across from Madison Square Garden in that area's cuisinary desolation would be alluring. And sure enough, it can be lively before a big game. But I couldn't find anyone willing to join me for a second tasting. As soon as I mentioned Eighth Avenue and 33rd, my pals would say, what else is on your list? Then my nephew and his wife came to town from San Diego. Eighth Avenue and 33rd meant nothing to them. How happy we all were with the pizza, our two pastas and the little vegetable ramekins - though a few were wildly salty. Groaning with the agony of too muchness, we shared Hazen's proud pork shank, a crusty delicious mastodon. 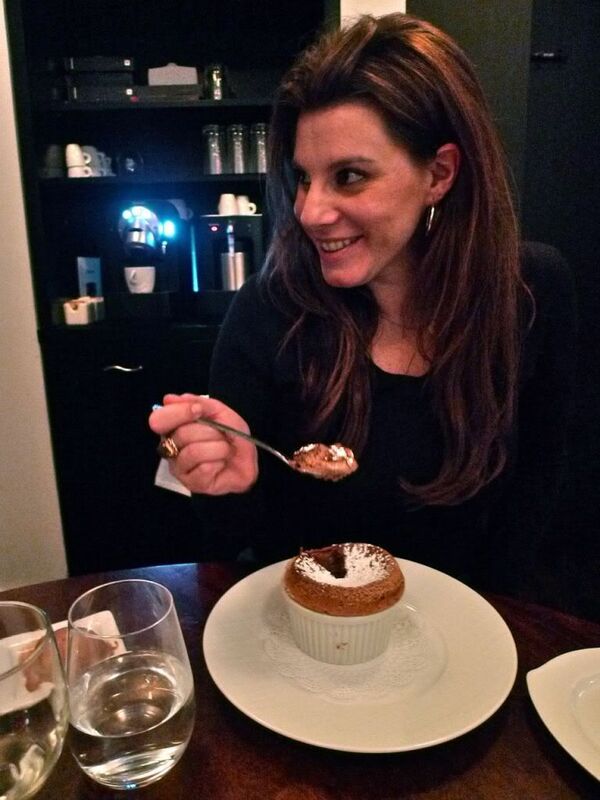 So when my friend, the publicist Karine Bakhoun invited us last week to share her table while she introduced the press to Lugo Caff� as it embarks on expansion, I laughed. I've already written about it, I said. Still, it's true, the media has neglected Lugo. It's not even listed in Zagat, 2012. But I was eager to catch up with the drama of Karine's life. Okay, the pizza is not as good as it was, and the caponata is still too salty, but I'd go back any time for the crispy fried artichokes, those meatballs in a bath of sensational tomato sauce and the marvelous semolina cavatelli "malloreddus" with house made sausage, porcini, olives and ricotta. Steven's linguine vongole was excellent too. And why are there headless mannequins in spiffy dress shirts high atop the check-in spot as you enter? That's because owner John Meadows, at just 31 years-old, has parlayed a menswear success into LVD Hospitality, a feeding and entertainment empire. LVD has restaurants and sandwich shops, backs chefs like Scott Conant of Scarpetta, Hazen at Veritas and Alain Allegretti at La Promenade des Anglais, and will soon open Lugo Caff� at Revel Casino in Atlantic City, then Miami and elsewhere on the East Coast. By the way, in case the integrity police are reading: we paid our check and Karine's too. 1 Penn Plaza. Thirty-third Street and Eighth Avenue. It looks cute, with mullioned windows, a string of small lights and a board out front advertising the $40 prix fixe. But inside, Jeanne and Gaston is almost empty -- a mix of bare brick, an application of style in black and white at the bar, Rembrandt textile guild members in a mural on the back wall. I recognize them from the Dutch Masters Cigar box. I immediately start Googling my brain for somewhere nearby we can flee. Coppelia, the Cuban spot across the street, I think. 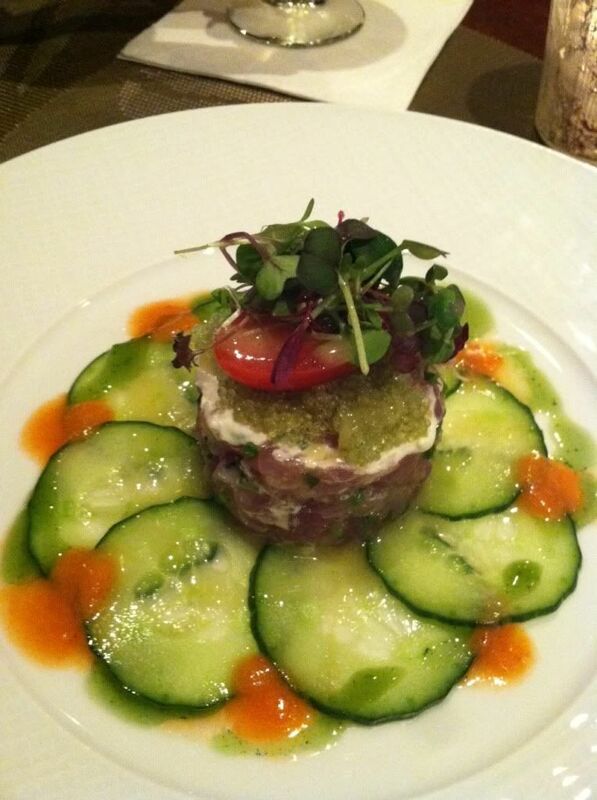 Our friends, having arrived early, are sipping Pinot Blanc at the bar and sharing a tuna tartare. "It's wonderful," she says. "Crisp on top." I tasted. That's the wasabi tobiko. Not exactly French. But that is Jeanne and Gaston. A little French. Somewhat new world. Named in homage to his grandparents by chef-owner Claude Godard from a Michelin-starred family in Burgundy. He has Madison Bistro, "delightfully average," says Zagat. Okay. We'll stick around and see how hors d'oeuvre go. Want to know what brought me back the very next day? Or if you should go for the $31 truffled macaroni? Click here. 212 West 14th Street between 7th and 8th Avenues. "Escoffier knows, our town has tangled with nouvelle cuisine -- we're up to our eyebrows in kiwi. So it's exciting to discover another nuance, a certain Verg� signature -- the pickled fruits and vegetables that pop up in unexpected places, a trace of coconut milk in a gossamer froth of spinach soup, the stunning asymmetrical collage of lamb's lettuce and berries that graces a garnish, a raspberry Rorschach blot on the plate below a nectarine tart. No, it's not instant perfection. The eye's astonishment is not always matched by the mouth's joy. But there are enough dazzlers emerging from the Polo's kitchen after ten weeks of this new incarnation to fill the house with that special breed of anonymous rich New Yorkers claiming their neighborhood turf...and clearly pleased with the buttery elegance." Boulud went on to run Le Regence the Plaza Ath�n�e and to the spotlight at Le Cirque, before opening his own Cafe Boulud. Along the way he became a passionate New Yorker and a devoted supporter of its many humanitarian causes, most especially Citymeals. For the past fourteen years, the chef has marked every major event in the life of his restaurants with a benefit to help Citymeals feed the city's frail homebound elderly. His black truffle and blue jean Sundays on our behalf have delivered more than a million meals. This year Thierry Gardiner and his wife, the new owners of the legendary Taillevent, will co-host the evening and their chef Alain Soliv�r�s will be in the kitchen alongside Boulud and the expanded team he rounds up from his restaurants. It is always very moving when the vast parade of men and women in white emerge to take a bow. I hope you'll join me at March 25 at Daniel Restaurant for this dinner and a live auction of money-can't-buy adventures and to celebrate this gifted man. His energy and enthusiasm are amazing. And contagious. Sunday chic means no tie required. Call 212 687 1290. On our first trip to Vietnam, I carried a thin little book called "Vietnam on a Plate" by Annabel Doling. It was more precious to me than my long ago forgotten guide book because it told me what to eat and how and where. The Road Food Warrior fell in love with Hanoi. We returned and spent a month in its crowded 39 street district, braving the unknown of the city's amazing street food when all we could do was point to a pot. We could have written "Hanoi Street Food" (Lannoo $37.50) by the end of that month. But we didn't. Tom Vandenberghe did. He's clearly nuts about Hanoi too. And Luk Thys shot the evocative images. You'll want to book a flight half way through the book. 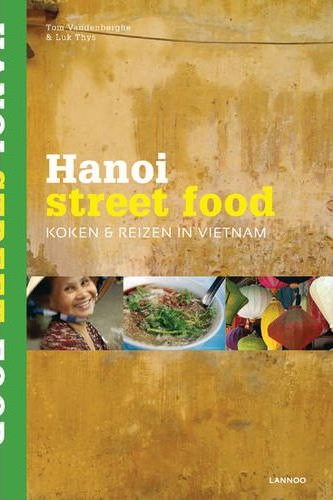 There are 60 recipes for street food, yes. But what you want are the addresses. It would help if the restaurant addresses at the end gave the specialty of each stall or stand rather than just a name in Vietnamese to save you paging back and forth between text and listing. Small gripe, I'd want his "Bangkok Street Food" too if I were going. 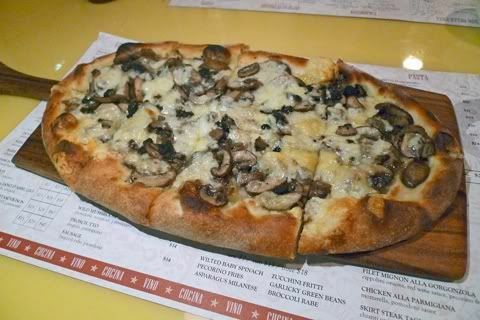 Photographs of Mushroom Pizza and Meatballs at Lugo Caff� and our friend Chana eating the chocolate souffle at Jeanne and Gaston may not be used without permission of Steven Richter. 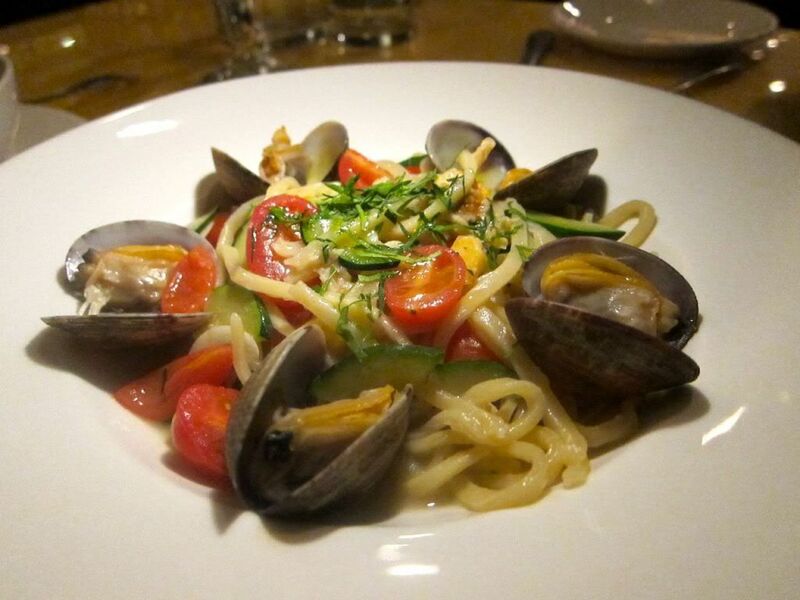 Photographs of Wagyu Skirt Steak and the Mysterious Carrots from Empell�n Cocina and the Linguine With Clams at Lugo Caff� may not be used without permission of Gael Greene.